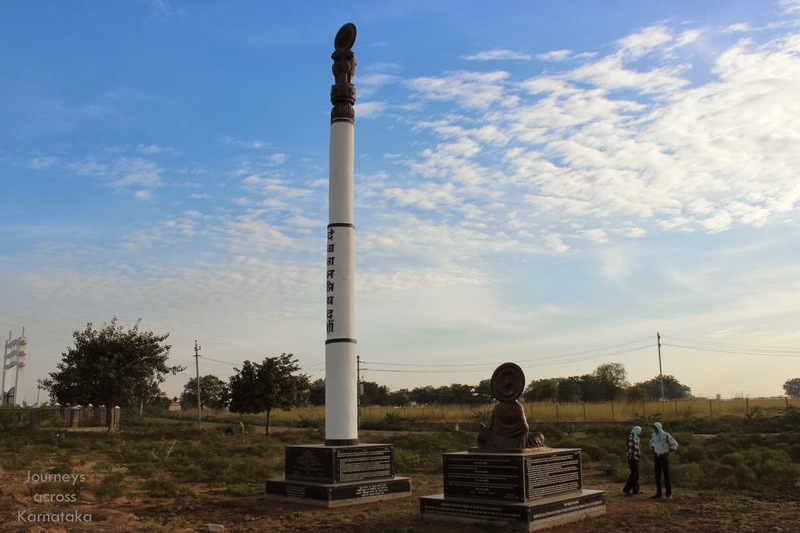 March 17, 2012 was the beginning of search for Ashokan edicts of Karnataka began at Gavimath, Koppal. With every find the search became increasingly interesting and challenging at times. The search was not limited to searching the Internet and visiting sites but also trying to locate the sources of history of the discovery of the edicts, their transliterations and translations. With my friend Shilpa's epigraphy notes, I could find impression sheets, transliterations & translations for some of the inscriptions. Mr. S B Hiremath of history department in Karnatak University helped me by lending a book on Asokan edicts and also allowed me to refer volumes of Corpus Inscriptionum Indicarum. Before 2013 came to an end all sites were visited with the last one being Siddapur edict, and by mid Jan 2014 all accessible information about the edicts were gathered. So the search was almost over.. unless some new discovery turns up. Our day started early at Shahapur. I was up and ready to move by 5-30, so was Suresh the cab driver. We had hot and fresh tea at the main square of Shahapur town. 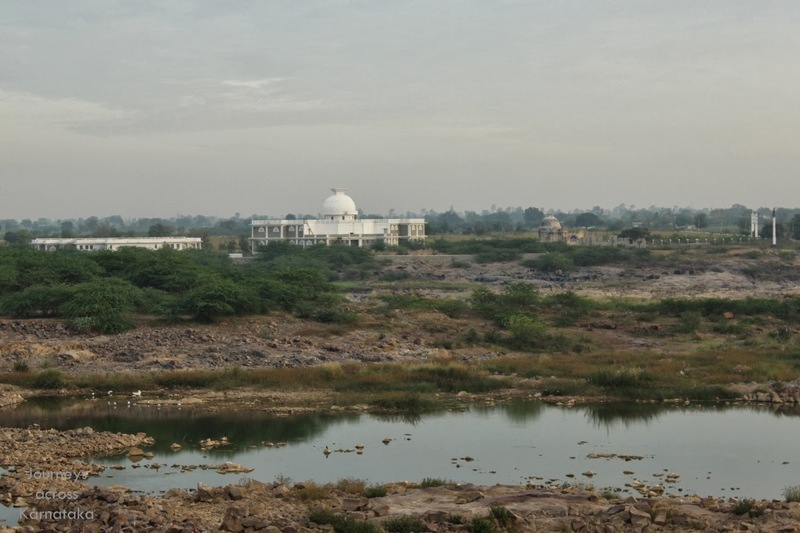 I was pretty excited about seeing the first major rock edict of emperor Ashoka at Sannati however I had to be patient until dawn so that it was light enough to see the outline of Shahapur hills. Yes, the plan was to see the sleeping Buddha hill. Indeed the hills looks like Buddha - many call this Nature's tribute to Gautama Buddha. Ideally the hill should be seen at dusk, when Sun is behind the hill it creates a beautiful silhouette of sleeping Buddha. We let Buddha sleep and start our journey towards Sannati. Though the distance between Shahapur and Sannati is 20 odd kilometers, the journey lasted almost an hour because we had to stop often to make sure we were heading in the right directions. Also, the last 4 kms were terrible, the road surface was a 3D sine wave, just I or II gears :-( Finally we made it to Bhima river, we were on the bridge looking at Yadgir district on the right and Gulbarga district on the left. 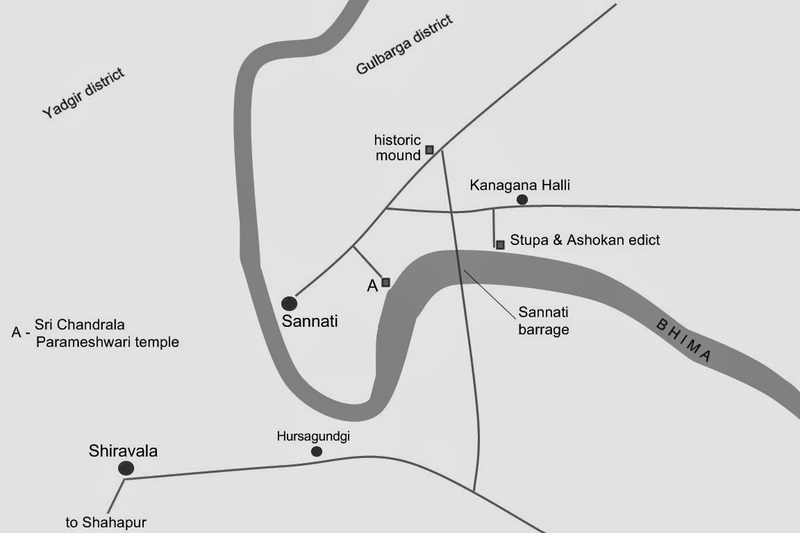 Here's a map of the area showing Bhima's path and locations of Sannati, Chandrala Parameshwari temple, Kanaganahalli and the stupa site. All these places mentioned are historically connected. Close to the Buddhist center is a recently built Stupa. The building was locked and a peep through the windows reviled a empty hall. Opposite the modern Stupa are two more creations- Ashoka Stambha and a life size statue of Samrat Ashoka. In the background is the site of the ancient stupa and the inscription. There was one security guard watching us closely. Suresh befriended him quickly. It was barely 8-15 AM then and the security guard told me visitor are allowed after 9-30 AM - ASI rules. He told us the area is heavily protected, it is guarded round the clock. I could not curb by eagerness.. my request to let me in earlier than usual was considered. As we stepped into the fenced area, a board blared in bold types- strictly no photography and videography. I was taken back, no photo?? Anyway, let me see the place first. 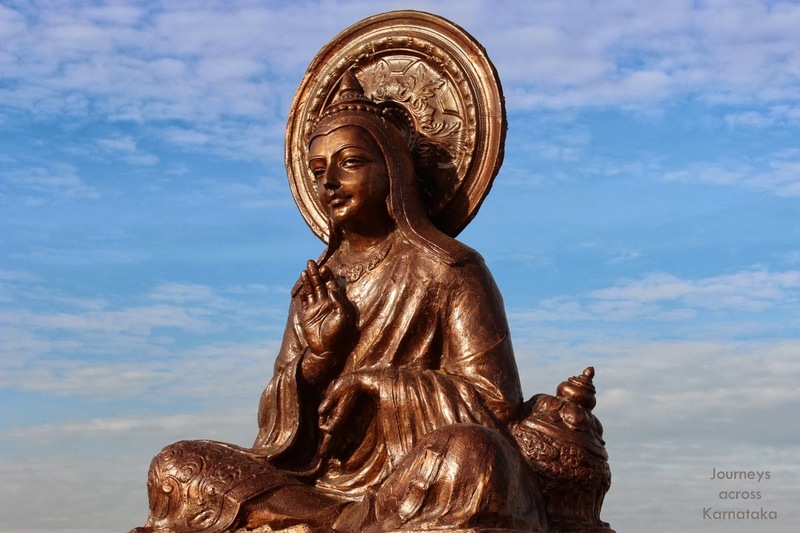 Around the ruins of the stupa was the collection of sculpted parts - sculptures which told stories from lives of Gautama Buddha and Samrat Ashoka. This site is important because of several reasons of which two are- 1. presence of major rock edict and 2. sculpture of Ashoka with his name engraved on the panel. I looked around for some time and the ban on photography was bothering me. I inquired about the caretaker of this site; he would be coming shortly. As I relaxed on a bench I had an idea, I made phone call to my friend who had introduced me to ASI officers. Luckily I got him and I was assured of obtaining permission in an hour. Great :) Mean time, a person had appeared - he happened to be a policeman on site duty. Wow! Also there were 6 or 7 uniformed security guards and gearing for their shift! The nearest place for breakfast was Chandrala Parameshwari temple. The temple is ancient with plenty of modern touches. With hardly any visitors Devi's darshan was easy. Breakfast was hot upit and tea at a small eatery next to the temple. Back at the Stupa site, the caretaker had arrived, after introductions I learnt that Hajim was a simple middle age man with lot of field experience in excavations. He had immense experience in piecing together broken sculptures. Finally I got a call from my friend, I was asked to speak to two officers and lo, permission was granted. With Hajim's permission too, I took few pictures and sharing the photo of the inscription. 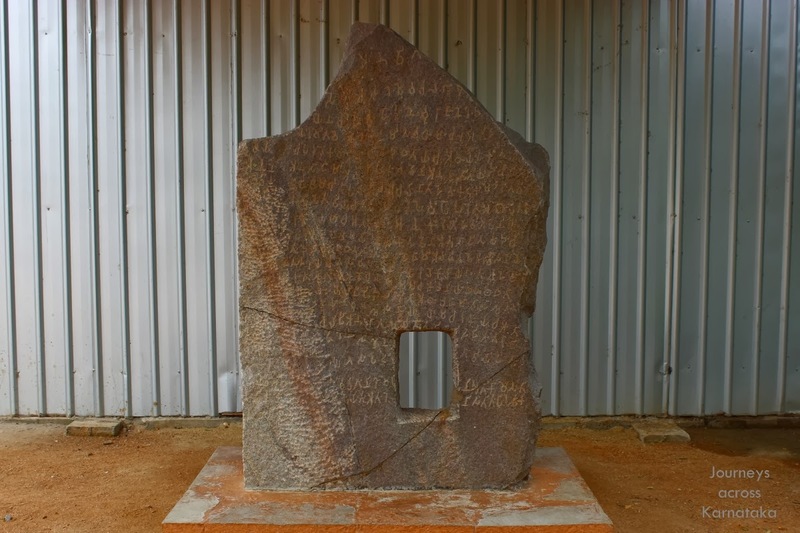 Sannati inscription is engraved on a semi-dressed slab rather than a natural rocks as in other Asokan site (in Karnataka). This damaged slab seen here was much larger originally. Both faces of the slab have inscriptions. At some point of time during the construction of Chandrala Parameshwari temple, builders used the slab to make a petha ~ a pedestal for mounting a deity. When placed horizontally, the rectangular hole receives the shaft of the statue placed vertically on the pedestal. As mentioned earlier, I have sourced some information from epigraphy notes and history books. Below are the extracts. It is a major rock edict. It also has the rock edict nos. XII and XIV. It was found in Sannati, a village in Chitapur taluq in Gulbarga district. 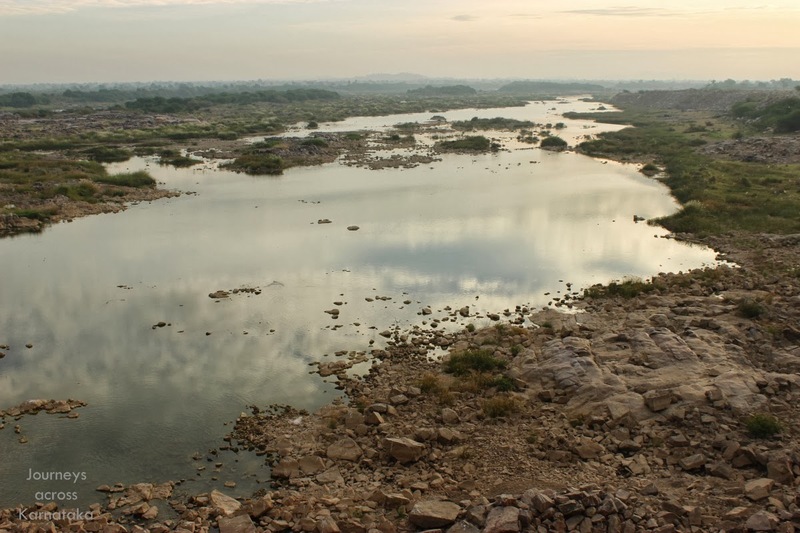 It is 27 kms from Yadgir and located on the left bank of Bhima, a tributary of river Krishna. Sannati is known for Chadralamba temple, a well known pilgrimage center. There's a fort in Sannati called Seturajanakatte but an eminent archaeologist opined that it must be 'Satavahara Kote'. The king's name was Beturaja. 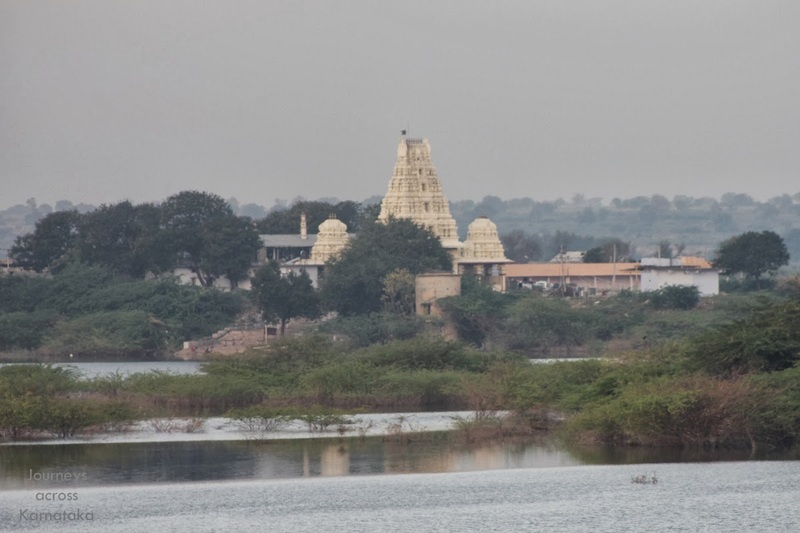 This site was first noticed by Kapatrao Krishnarao. His article was published in Karnataka Samskruti Samshodhana. In his article he highlights the importance of this place. Dr. M Sheshadri, the director of state arcaeology (1964-65) conducted excavations. In 1966 Dr. P V Desai former director of KRI opined that Sannati is a well known and important Buddhist centre of Karnataka. In between Sannati and Kanaganahalli, we find a number of cultural and architectural remainders belonging to pre-Shatvahana. It includes tap, tides and decorative parts of Buddhist Viharas. Also vessels made of mud and beads made of crystals & other stones and ornaments made of conch. All these antiquites belong to early historic period. Here we find 46 inscriptions in Sannati and most are of one line i.e. label inscriptions including Ashokan inscriptions. Most are of Shatvahana and Rashtrakuta period. Some are written on sculptures. In the complex of Chandralamba temple, there is a temple of Mahakali locally known as Mahakaliagni. It was constructed after the downfall of Buddhist.It is renovated several times but the Garbhagriha has Rashtrakuta features. The Garbhagriha is in square shape and it has Antarala and Mukhamantapa. There are 6 pillars and some half pillars. In the Garbhagriha is an idol of Chamundi. It is broken into two at the pedestal of the goddess. 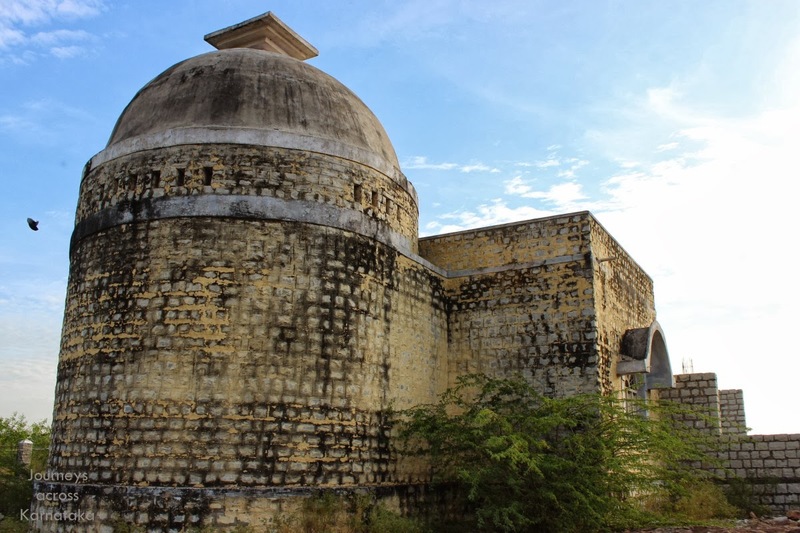 The discovery of Ashokan edict at Sannati was in Jan-Feb 1989 by R V Shivsharma (Assistant Superintendent) and J Varaprasad Rao (technical staff) of ASI Hyderabad. I K Sharma also visited and declared that it belongs to Ashoka. Also a well known archaeologist S R Rao (known for Sindhu lipi decipherment) also visited this place. He hints that it is Ashokan Brahmi or of a little later period. The pedestal where this inscription is engraved is a brownish granite 2.33m x 1.21m x 0.3m thick. Usually Ashokan edicts are found on natural boulders and pillars but here in Sannati a block is prepared and on both sides inscriptions are engraved. Major edicts are 24 and special rock edicts I & II available in Dhauli are found in Sannati as well i.e. the Kalinga version. It is written as a special rock edict for neighboring people. All Major Rock Edicts were within the kingdom. The 2 edicts XII and XIV on the first face (A) of the slab in Sannati were discovered by Sarvashri R V Siva Sarma and J Vara Prasada Rao. It contains in all twelve lines. The upper and the lower four are separated by a short horizontal stroke at the left margin indicating that they are two different edicts. The ridged border and the sizing of the rock to prepare the nalika (water chute) has caused serious damage to the letters of the text. The beginnings in some lines and the right extent of the inscribed part are badly damaged as a result, the full text of the existing edicts cannot be made out. The writing is somewhat indifferent. The lines are not straight but leaning towards left though the letters are subjected to polish, the traces of which can be felt. The letters forms recall Minor Rock Edicts I-II of Nittur and Udegolam etc. The extant record on this face is incomplete, as the slab is broken at either sides, but does provide some clues for identification and proper assignment. The text is in lines of Brahmi characters of the Ashokan times, the language being Prakit. In line-9, the clear mention "iyam dhamma lipi devanam piyena" is enough to assign the edict to Asoka. In the available portions, however, there is no mention of the personal name of Asoka. 2. Both with gifts and with honors of various kinds (irrespective of wwhether they are ascetics or householders). 3. But th beloved of Gods does not value either the (offering of) gifts or the honoring (of people) so (highly) as the following, viz., that there should be a growth of the essentials of Dharma among men of all sects. 4. But a promotion of the essentials (in Dharma is possible) in many ways its toot is thus guarding (one's) speech, that neither praising one's own sect or disparagement of other sects should take place. 5. It should be moderate in every case even on appropriate occasions. 7. If a person acts otherwise (he) not only injures his own sect very severally but also harms other sects. 8. All (this) out of devotion to his own sect with a view to glorify his own sect if he is acting thus, he rather injures his own sect severally. 9. Therefore, concord alone is meritorious i.e. they should both hear and obey each others morals. For this is the desire of Devanampriya that all sects. 10. Become well informed and acquire pure knowledge of the doctrine and those who are attached to their respective (sects) out to be spoken to (as follows). Devanampriya does not value either the (offering of) gifts or honoring (the people) so highly as the following. 11. That promotion of the essentials of all sects should take place and many officers are occupied for this purpose, the mahamantras in-charge of dharma the mahamantras in-charge of the (matters relating to) ladies. 12. The officers in-charge of (my cattle and) pasture lands and other classes (of officials). And the result of their acts is the promotion of one's own sect and the glorification of Dharma. 1. This record relating to Dharma has been caused to be written by king Devanampriya beloved of Gods. 2. Either in abridged (form) or of middle (size) or at full length. 3. And the whole was not suitable everywhere. 4. For (my) dominions are wide, and much has been written, and I shall certainly cause still a lot (more) to be written. 5. And (some) of this has been stated again and again owing to their sweetness, so that people may act accordingly. 6. Thus there may be some (topic) which have been written incompletely either on account of the locality, or because (my) motive was not liked or owing to a fault of the scribe. The characters of the record on the reverse face are closer to teh ones discovered on the (A) First Face and somewhat better preserved because the slab was buried under the soil and not affected by human activity. 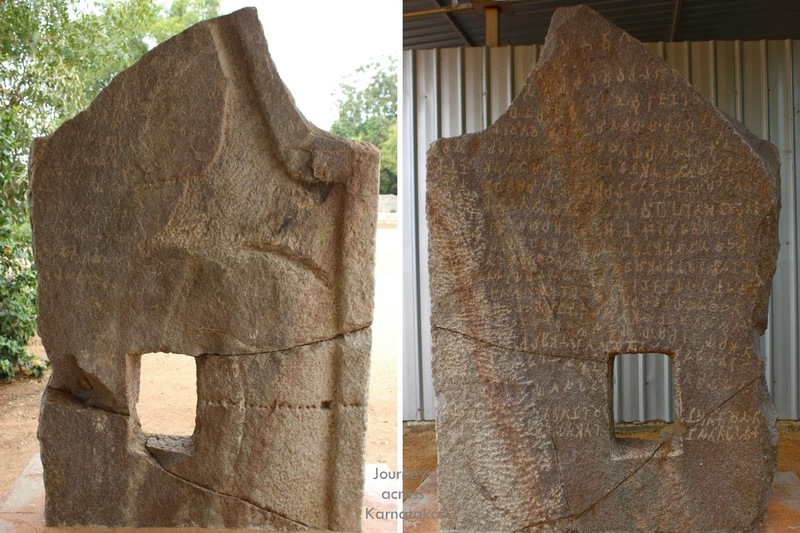 The text, is, therefore, better preserved.The content of the major record which occupies the central portion of the stele is very similar to the Separate Rock Edict II found at Jaugada, District Ganjam, Orissa. A version of this Separate Rock Edict was also found at Dhauli in Puri District along with separate Rock Edict I. D.C. Sircar regarded this separate Kalinga edict as Rock Edict XV. Though numbered as Separate Rock Edict II in the sequence this is actually the first one to be carved. In the Sannati record, minor textual variations can be noted. There is no mention of the epithet devanam priya or piyadasi laja etc. but referneces to mahamantra (line 14) is seen and the name of the king is also not mentioned. But in Jaugada version, besides the devanampriya a viceroy named Samapa was also cited. In Kalinga country (Dhauli and Jaugada) the Separate Rock Edict are issued in place of Rock Edicts XI, XII and XIII. While at Sannati we know about Edicts XII and XIV clearly but the rest are fragmentary in nature. Presently they could be satisfactorily identified too. Thank you for the informative article. It must be a result of several months of research and on location visit! Full of nice effort !! Enjoyed while reading !!! thank you, Sunita ans Santosh. Thanks Siddheshwar and Santosh. Ihave referred to you in my book Buddhist Heritage Sites of India revised and updated to be out by Sept.
Actually went to Sannati and saw how beautiful it is. ಅಶೋಕನ ಶಾಸನಗಳ ಬಗ್ಗೆ ನಿಮಗೆ ಬಹಳ ಮಾಹಿತಿ ಇರುವಂತೆ ತೋರುತ್ತದೆ. ನನ್ನ ಕೆಲ ಸಂದೇಹಗಳಿಗೆ ನಿಮ್ಮಲ್ಲಿ ಮಾಹಿತಿ ತಿಳಿಯಲು ಇಚ್ಛಿಸುತ್ತೇನೆ. ೧.ಅಶೋಕನ ಯಾವ ಶಾಸನದಲ್ಲಿ ಸುವರ್ಣಗಿರಿ ಕಂಡು ಬರುತ್ತದೆ. ೨.ಆ ಸುವರ್ಣಗಿರಿ ಕರ್ನಾಟಕದ ಕನಕಗಿರಿ,ಮಸ್ಕಿ,ಕೊಪ್ಪಳ,ಸನ್ನತಿ ಅಥವ ಬೇರಾವುದೆ ಸ್ಥಳವಾಗಿರಬಹುದೆ? ೩.ಮಹಾರಾಷ್ಟದ ಠಾಣೆ ಜಿಲ್ಹೆಯ ವಾಡಾ ಸುವರ್ಣಗಿರಿ ಇರಬಹುದೆ? ೪.ಒಬ್ಬ ಹೆಸರಾಂತ ಇತಿಹಾಸಜ್ಞರು ಅದು ಸನ್ನತಿ ಅಂತಾರೆ.ಆಧಾರ ಕೊಟ್ಟಿಲ್ಲ.ಅವರ ಮಾತಿಗೆ ಪುರಾವೆ ಸಾಧ್ಯವೆ?